Thank you Jo NY, for testing this pattern. 4. For a smaller mitt use G hook and change to H after the cuff. Foundation chain: With H hook, ch 26 , join with slip stitch in first chain. Change to I hook for remainder of mitt. Another nice pattern. Would go great with the hat. I've been following your blog for awhile & wanted to tell you that I've made some of your AWESOME patterns for friends & family (& some for me, too! :) ), & they have been received with great joy & appreciation. We have similar tastes, & making your items is almost like making my own designs. I've had to give up designing due to arthritis in my hands, but I'm blessed that I can still crochet. I always look forward to seeing what your next creation will be. Thank you for sharing your patterns. I made your butterfly mitts and some hats with a butterfly too! Thank you for sharing your pattern! Love this pattern... quick and easy. Made a small pair for my little girl, adult pair for my mom, thinking about making more for our church's mission faire. They're so sweet and WARM! I'm pleased to read you are enjoying the pattern. So cute! I am going to try these for my daughter. She will love them!! Thank you for your beautiful, talented, warm yarn hug ideas. I started crocheting to honor the memory of my grams. I lost her in the middle of a crisis and crocheting has helped make my life less sad. I love your butterfly patterns most because they represent hope. You should know that I share these yarn hugs with a lot of people who need hope. It pleases me to think of my patterns helping you through a rough patch of life. 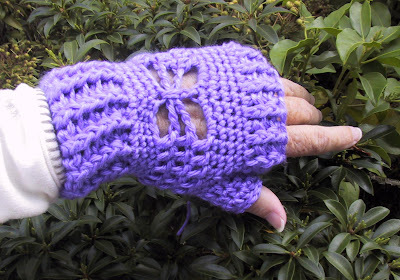 I love making fingerless gloves and these are so cute! Thank you for sharing your creativity!